Dear traders, head and shoulder chart pattern formation is very common on candlesticks chart. This post is aimed to explain the ways to trade forex with bearish head and shoulder pattern formation. Bearish head and shoulder pattern is also called top head and shoulder, but it can be found anywhere on the forex chart.In a bearish head and shoulder formation there is a left shoulder, a right shoulder, a head and a neckline. The shoulders and head carry resistance levels on the top. Neckline is drawn adding the support levels by a straight line.The order is generally placed after the right should formation. Breakout of the neckline ensures the downtrend. 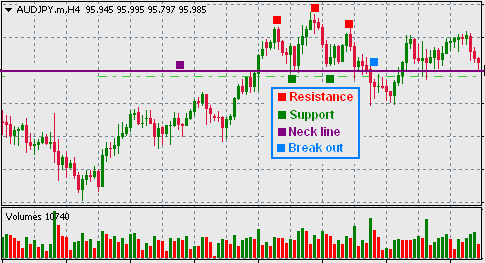 So logically a sell order with bearish head and shoulder should be placed just below the breakout point. If an order is placed just at the right shoulder (after any other pattern break out), the stop loss should be placed at the resistance level on the top of the head, but if the order is placed after the break out, the stop loss should be placed at the resistance level on the top of the right shoulder.